[See a larger version of the image as an engraved print for more details]. The first president of the United States, George Washington, was born on February 22, 1732 and died on December 14, 1799. The third Monday of February is designated "Presidents Day" in the United States. It was first proclaimed quite late in the history of the republic (1880) and therefore was not part of the evolution of the office of the presidency in its first hundred years. In fact, the founding fathers would probably have been horrified at the thought of paying hommage in this way to a single man or even the office of the presidency when more abstract notions of "liberty" and the "rule of law" were still so highly regarded. Celebrating the man would have smacked too much of the idea of kingship which they had fought so hard against in the 1770s and 1780s. There had been some talk of making the highest political office in America an "elected monarchy" but even a wealthy, slave owning, ex-general like George Washington baulked at the idea. Thomas Paine (see this quote of the week on Paine's idea that only "the law was king" in America) had to persaude some of his contemporaries in 1776 (in Common Sense) that if they thought it a "deficiency" not to have a King in an independent America then they might prefer to think that their "King" was the rule of law and the "Charter" or constitution which embodied the law. In these passages Paine worries about a newly independent America reverting to a monarchy. Paine thought an agitator like Massanello might prey on discontent to take over the government and declare himself king. Thomas Jefferson, in a letter to Robert Livingston (December 1800), worried in a similar fashion that republicanism in America was only skin deep and that there lurked a monarchie masquée (hidden monarchy) just below the surface. Furthermore Paine thought, if a day of celebration were to be set aside then homage should be paid to the law (the “Charter”), a crown set upon it to remind those gathered that “the law is king”, and at the end of the ceremony the crown should be smashed and scattered among the people as a reminder that the notion of kingship is a dangerous thing in a free republic. One wonders what he or Jefferson would think of the modern celebration of the man and the office known as "Presidents Day". To return to the origin of "Presidents Day" (or Washington's Birthday as it was originally known), it was first proclaimed in 1880 as a holiday for federal workers only in the District of Columbia (thus it was a holiday to enable federal government workers to have a paid day not to work). It was extended to workers in all federal offices across the nation in 1885. It was the first federal holiday to celebrate a single individual (Washington) and it fell on George Washington's actual birthday February 22, 1732 (although his birthday was in fact February 11 under the old Julian calendar - but the new Gregorian calendar had been introduced across the British Empire in 1752 and so according to this revised calendar his new birthday was now February 22). [See the Wikipedia entry on Washington's Birthday <http://en.wikipedia.org/wiki/Presidents_day>]. In 1951 during the early years of the Cold War a group began agitating for Congress to establish a "Presidents Day" to honour all the presidents as well as the office of the presidency itself, no doubt in an effort to emphasize the role of the office of the Presidency in the American republic in contrast to the recently defeated Il Duce of fascist Itlay and the Führer of Nazi Germany, as well as the powerful "Secretaries" or "Chairmen" of the communist parties of the Soviet Union and China. February was seen as an appropriate month because both Washington and Lincoln had their birthdays then (Lincoln on February 12) and both were regarded as crucial "fathers of the nation" - Washington for leading the military at the founding of the nation and Lincoln for using the military to forcibly maintain the union of the states in the face of seccession. Legislation in 1968 retained the name "Washington's Birthday" for the public holiday but in popular parlance it has become known as "Presidents Day", which was part of a more encompassing "Uniform Monday Holiday Act" (1971). 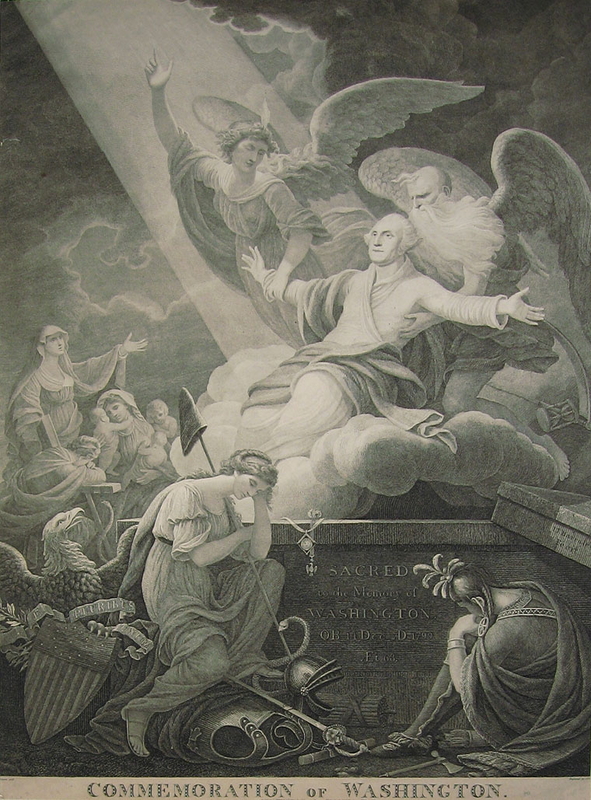 The engraving below by David Edwin is called "Apotheosis of Washington" (1800) and shows Washington, dressed in his burial shroud and clothes, sitting on clouds above Mount Vernon. An angel (or Cupid) is laying a laurel wreath on his head in an effort to bestow immortality upon him. To the right two men are standing suspended in the clouds gesturing to Washington perhaps in welcome to heaven. They are Richard Montgomery and Joseph Warren who were both major generals in the Continental Army during the Revolution and who were killed in battle in 1775. [See a larger version of the image for more details]. [Source: the C.W. McAlpin Collection at the New York Public Library <http://legacy.www.nypl.org/research/chss/spe/art/print/exhibits/revolution/selection7.html> and the National Portrait Gallery, Smithsonian Institution]. 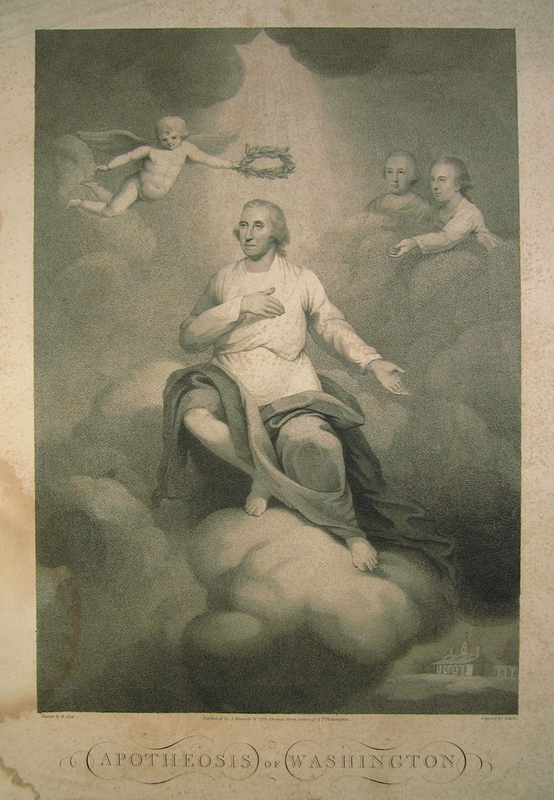 An image which first appeared in 1802 and was reproduced in many forms (including prints and painted glass) has the title "The Apotheosis of Washington" or "The Commemoration of Washington" (as it first appeared in February 1802 when Washington would have turned 70). It shows George Washington ascending into heaven assisted by Father Time and an angel (or "Immortality"). Shafts of light shine down from heaven through a break in the clouds as the angel and Father Time lift Washington, wrapped in a red piece of cloth or perhaps his burial shroud, from what appears to be his coffin or crypt. To the left three women (Faith, Hope, and Charity) can be seen: one holds her hand out towards him grieving; another holds two children in her arms; and a third is slumped forward on her arms weeping. Beneath Washington can be seen an American eagle, the American shield on which is written "e pluribus unum" and Liberty, whose head is bowed in sorrow. Her staff with the red phrygian cap is resting among Washington's discarded armour and sword which lie beside a facses. In the far right bottom corner we can see a American Indian with his hatchet and arrows sitting with his head resting on his knees. On the tomb is written the words "Sacred is the Memory of Washington OB 11 Dec. - D 1799. Et. 68". [Sources: photograph of a painting on glass held by the Library of Congress; engraving and etching held by the New York Public Library <http://legacy.www.nypl.org/research/chss/spe/art/print/exhibits/revolution/selection7.html>]. The next example was a popular postcard which was produced in considerable numbers after the assassination of President Abraham Lincoln in 1865. It depicts Lincoln ascending into heaven. He is dressed in black robes as is George Washington who is embracing him in welcome and is about to place a laurel wreath upon Lincoln's head. Angels are beckoning him to ascend towards the light which streams from the top left of tthe image. [Sources: a variety of non-copyright web sites and the Library of Congress]. 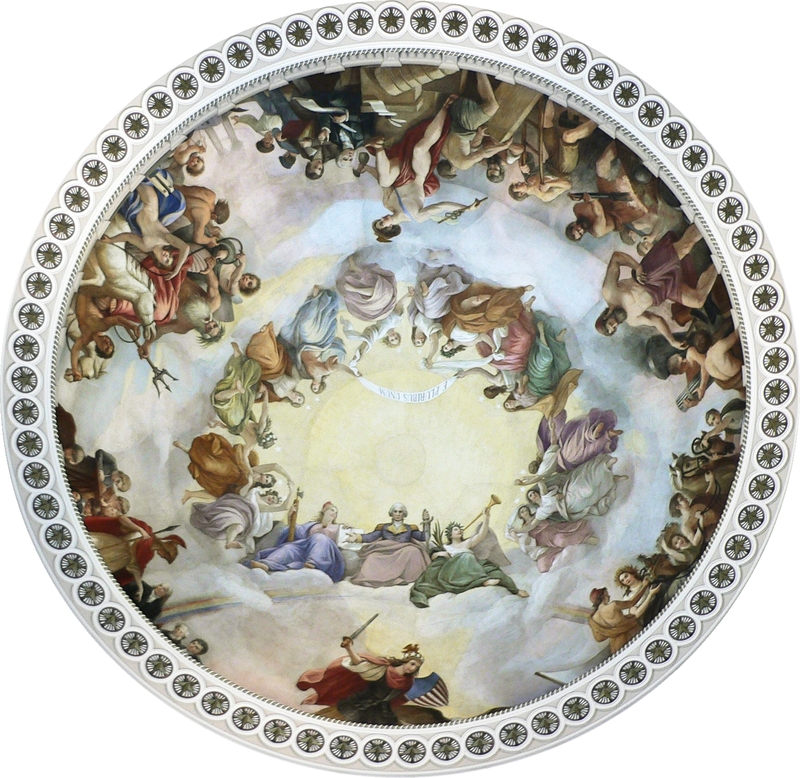 Constantino Brumidi, "The Apotheosis of George Washington" (1865), Capitol Building, Washington, D.C.
Washington has become godlike (if not a god) and has ascended into heaven. He sits on a cloud wearing a military jacket in purple (the traditional colour worn by the Roman emperor) and his legs are wrapped in a sheet (also purple). In his left hand he holds a sword and his right hand is gesturing to a book (possibly the constitution of the US). At his left sits Victory draped in a green sheet and wearing a laurel wreath, holding a branch and blowing a turmpet. To Washington's right sits Liberty. She is wearing a red phrygian cap and holds the book to which Washington is gesturing in her left hand; in her right hand she is holding the Roman fasces. [See the detail below]. "Liberty" (or "Columbia") is seen in the more aggressive pose of a warrior brandishing a sword in her right hand and carrying a a shield with the stars and stripes in her left hand. At her left side is an equally aggressive American eagle with mouth open and talons clutching a sheaf of arrows. Beneath them are their defeated enemies who are hard to identify but are most likely an assortment of tyrants, kings, and oppressors who are very fearful of Liberty and her eagle. The woman at the left has her hands outstretched in a pose of submission; the white bearded man next to her is clutching a cannon; the dark bearded man in the center is attired in a uniform of boots, breastplate armor, and helmet, and appears to have a club or weapon in his left hand; the person next to him is wearing a brown cloak and is holding a burning torch in his or her right and left hands; the final figure to the right is holding their hand to their face in a look of bewilderment at the power of Liberty. [Sources: Wikipedia article on "The Apotheoisis of Washington" <http://en.wikipedia.org/wiki/The_Apotheosis_of_Washington> and The Architect of the Capitol website <http://www.aoc.gov/index.cfm>]. Among the many striking things about Brumidi's fresco are the following: the monumental physical scale of the painting, the fact that it was given such prominence in the expanded and rebuilt US Capitol Building, that it was completed at considerable cost during wartime, the clear religious iconography used by Brumidi as he had done previously in explicitly religious paintings in Italy and in New York, the fact that this was not the first occasion when artists depicted the assumption to heaven of Washington and suggested he had god-like powers (the first was immediately after Washington's death in 1799), and the links made between the military leader Washington who defeated the British to "forge" a nation" and the acts of Lincoln in using military force to "preserve the union".